At the modest St. Stephen’s Theater on Ludlow Street, Lantern Theater Company’s production of Anton Chekhov’s Uncle Vanya is selling out performances. This revival captures the play’s timeless universality via Mike Poulton’s great English translation, which contemporizes with skill and wit. Chekhov’s 1897 old-Russian caste system is the backdrop of a domestic drama of an ailing academic who retreats to the family estate with his young wife, Yelena. 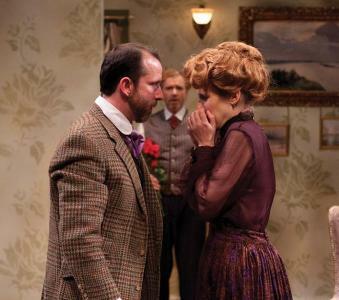 Vanya and his hapless niece, Sonya, are the put-upon caretakers. Astrov, a doctor, is more interested in tree conservation than caring for people. Meanwhile, he lusts after Yelena, while Sonya lusts after the doc and others look on. Fortunately the vodka is set up on the sideboard. Director Kathryn MacMillan lets this contrivance play for natural laughs as she orchestrates a fine eight-member ensemble like a chamber orchestra. Peter DeLaurier is both subtle and arch, articulating Vanya’s fine mind and big heart, even as he rails against hypocrisies of his society and his privileged relatives. Melissa Lynch gives Sonya a heroic dignity as she tries to be the family diplomat and tries not vanish into the woodwork. Sarah Sanford makes Yelena a study in contrasts who is just as loving as she is shallow, vain or lustful in warding off boredom. Sanford and Lynch just nail their delicate balance in the bonding and boozing scene. Charlie DelMarcelle is equally dimensional as Astrov, looking for existential purpose or at least a bit on the side. The thankless one note cave-in professor is played to death by David Howey. David Blatt, last seen as the formidable de Sade in EgoPo’s “Marat/Sade” at the Philly Fringe Festival this summer, is Telegin, the placid guitar-strumming grounds worker representing exploited peasantry. Also wonderful are Ceal Phelan, the family matriarch, and Ann Gundersheimer, the servant, who give elegantly crafted silent performances that speak volumes. The design team somehow makes the tight Lantern stage suggest the airiness of a Russian summer house. The lighting by Tom Weaver is downright poetic (northern light shadows a la Ingmar noir). MacMillan’s clockwork ensemble and Poulton’s translation lets this Vanya breathe with no expiration date.